OSBORN, Sir DANVERS, member of the Nova Scotia Council, governor of New York; b. in England 17 Nov. 1715; d. in New York 12 Oct. 1753. Danvers Osborn of Chicksands, Bedfordshire, was the son of John Osborn and Sarah Byng, daughter of George Byng, 1st Viscount Torrington, and sister of Admiral John Byng. Danvers’ grandfather was Sir John Osborn, 2nd baronet, and from him he inherited the title in 1720, as his father had already died. On 25 Sept. 1740 Danvers married Lady Mary Montagu, sister of George Montagu Dunk, 2nd Earl of Halifax, president of the Board of Trade from 1748 to 1761. Lady Mary died on 23 July 1743, after giving birth to their second son. Sir Danvers was greatly affected by her death and never seemed to recover his spirit afterwards. For several years he led a restless life, and spent some of his time at Horton, Northamptonshire, with his brother-in-law, the Earl of Halifax. In 1745, during the rebellion of Charles Edward, the Young Pretender, Osborn raised and led a troop of men in support of the king. He was elected to parliament for Bedfordshire in 1747. 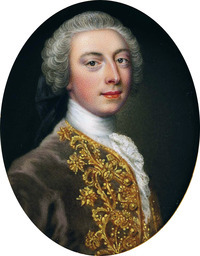 In 1750, possibly through the influence of the Earl of Halifax, he went to Halifax, Nova Scotia, where he became a member of the Nova Scotia Council on 29 August. During his attendance at council meetings in the next month, Osborn and his associates were faced with such problems as the victualling of new settlers, the suppression of “the scandalous practice of selling meat and other things publicly on the Lord’s Day,” and the payment of wages to labourers employed on the king’s works. After being in Halifax for six weeks, Sir Danvers returned to England, and on 18 December he discussed the financial affairs of Nova Scotia with the commissioners for Trade and Plantations. In May 1753 the Board of Trade recommended the appointment of Osborn as governor of New York, and his commission to that office was approved in July. He was officially welcomed on 10 October by the mayor, aldermen, and people of the city of New York. On the morning of 12 October, however, he was found in the garden of the house where he was lodging “strangled in his Handkercheif.” In reporting Osborn’s death to the Board of Trade, Lieutenant Governor James DeLancey observed that although Osborn “expressed his sense of the peoples joy upon his accession to the Government in the most engaging manner, yet he never shewed any cheerfulness, but appeared with a sedate and melancholy Countenance, complaining of a great indisposition of body and disturbance of mind, which could not be diverted.” It was later said that Osborn had made two previous attempts at suicide. Osborn’s body was at first interred in a vault in the chancel of Trinity Church, New York, and was taken to England in 1754. PANS, RG 3, Minutes of Nova Scotia Council, 1750; Unpub. papers of N.S. Hist. Soc., Danvers Osborn, “Sir Danvers Osborn and his services in connection with the founding of Halifax” (paper read at N.S. Hist. Soc. meeting, 8 March 1918). PRO, Prob. 11/696, f.105; 11/807, f.53. “The burghers of New Amsterdam and the freemen of New York, 1675–1866,” N.Y. Hist. Soc. Coll., XVIII (1885). [Cadwallader Colden], The letters and papers of Cadwallader Colden . . . (9v., N.Y. Hist. Soc. Coll., L–LVI (1917–23), LXVII–LXVIII (1934–35), New York, (1918–37), IX. Documentary history of New York (O’Callaghan), IV, 1057–58. NYCD (O’Callaghan and Fernow), VI. N.Y. Hist. Soc. Coll., III (1870). N.S. Archives, I. PRO, JTP, 1749/50–1753; 1754–1758. T. C. Banks, The dormant and extinct baronage of England . . . (4v., London, 1807–37), III, 335–37. Bernard and A. P. Burke, A genealogical and heraldic history of the peerage and baronetage, the privy council, knightage and companionage, ed. A. W. Thorpe (80th ed., London, 1921). Debrett’s baronetage, knightage and companionage (London, 1895). Herald (Halifax), 1 July 1899. The Victoria history of the county of Northampton, ed. L. F. Salzman (Victoria history of the counties of England, London, 1900– ), IV (1937), 259, 261. Charles Bruce Fergusson, “OSBORN, Sir DANVERS,” in Dictionary of Canadian Biography, vol. 3, University of Toronto/Université Laval, 2003–, accessed April 24, 2019, http://www.biographi.ca/en/bio/osborn_danvers_3E.html.